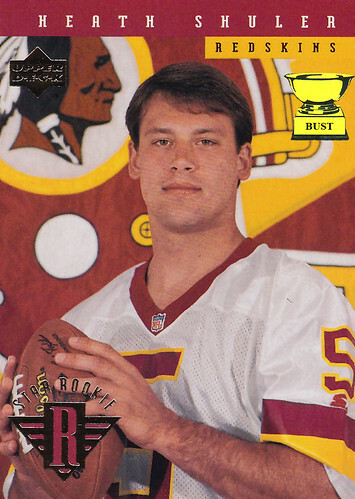 Redskins' scouting report on draft pick Heath Shuler, circa 1994: "He bears a resemblance to John Elway, so that's gotta be worth at least a couple wins a year right there. ... As part of his contract, he wants a new bowl to use during his haircuts. ... He's really into Ace of Base. No, seriously, he carries around a sign that says "I saw the sign." It's just weird. ... At the very least, he'll lead the league in arm hair. ... This kid's got an arm like a cannon: old, rusted and obsolete. ... For his next football card, we should make him dress up in an offensive outfit."